Seattle’s is not the only police department struggling with how to release, store and retain the stream of video expected to be collected when officers are outfitted with body-worn cameras. Police leaders from other cities came here Tuesday to investigate the issues. How police should release, store and retain the running stream of video collected when officers wear body cameras is not just an issue Seattle Police Department is struggling with. 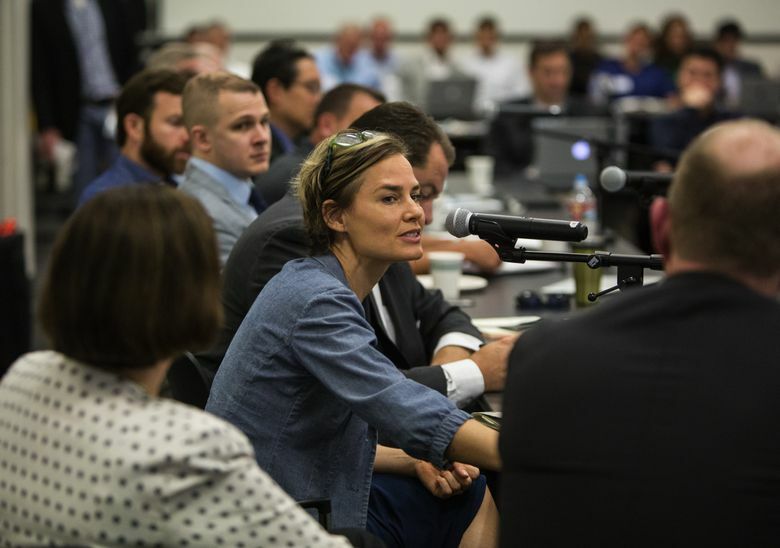 On Tuesday, police leaders from Orlando to Dallas gathered in the basement of Seattle police headquarters to discuss possible solutions, and to hear from technology experts. Addressing the potentially sensitive images captured by police officers has been so present on the minds of law enforcement that the White House sponsored the “Police Data Initiative” earlier this year to investigate the issue. Seattle police, who are part of the White House effort, are in the final weeks of a pilot project that placed body cameras on a handful of officers in the East Precinct. While department officials hope to have cameras on all patrol officers next year, they have yet to come up with a clear strategy on how to retain, store and release video sought through public disclosure. The group gathered in Seattle Tuesday included police from Florida, Texas and Kentucky, as well as local media lawyers and Jennifer Pahlka, founder and executive director of Code for America, a nonpartisan organization for technology initiatives that has been likened to the Peace Corps or Teach for America. A representative from Taser — a major supplier of police video cameras and one of two companies being considered for the Seattle contract — was also there. “We don’t claim to have all the answers, that’s for sure,” Seattle Police Chief Kathleen O’Toole said to the group. Seattle Police Chief Operating Officer Mike Wagers said the department has a team dedicated to the video issue. The team includes Greg Russell, a former Amazon executive hired three months ago as the Seattle Police Department’s Chief Information Officer, and Tim Clemans, a self-taught programmer who made headlines last year when he inundated the department with public-disclosure requests. The department hired Clemans soon after he dropped all of his public-disclosure requests. Russell said he wants to find easy-to-use software and technological devices to make officers’ jobs easier. He said he’s confident that at some point the department will be able to live-stream video from body cameras, all while redacting and keeping private, sensitive information out of public view. Smith said that once Seattle’s pilot program ends, “the cameras go back onto the shelf” until the department negotiates a contract with the Police Officer’s Guild. “This is a huge change in working conditions. It’s one more thing officers are accountable for,” Smith said. During Tuesday’s forum, Dallas Police Department Assistant Chief Tom Lawrence peppered Wagers, Russell and others with questions. Dallas police completed a pilot project outfitting 150 officers with body cameras earlier this year and are on track to get 1,000 cameras onto half the patrol division within the next three years. Lawrence, who attended a body-camera technology summit in Boston last week, said his department quickly needs to come up with an efficient and affordable way to release video to requesters. Information from Seattle Times archives is included in this report. Jennifer Sullivan: 206-464-8294 or jensullivan@seattletimes.com. On Twitter @SeattleSullivan.